Blue Buffalo is known for making a big variety of dog foods to meet the needs of dogs of all sizes, ages, as well as those with special dietary requirements. This grain-free dog food is impressive because of the short ingredient list that packs a lot of meat into the diet of your dog. Beef and chicken are the main ingredients. No cheap fillers like animal by-products or digest. Potatoes add texture and starchiness for increased palatability. Fortified with the vitamins and minerals your dog needs for optimal health and vitality. This is a great canned dog food for the pet parent that wants a canned dog food that offers fantastic taste and is easy to digest. For dogs that need a diet high in animal proteins this is a canned food that will do the job. Scout recommends this food for small to medium dogs or as a supplement to a quality dry dog food if you have a larger dog. I know that if I set this food out for my big dogs as a relish on top of their food they are doing to eat their food super fast! This can help dogs that are picky to eat their food better,. Chelate, Sodium Selenite, Potassium Iodide, Choline Chloride. Depending on your dog’s size and activity level, they may need more or less food in their daily feeding amounts. Feed 1/2-1 can per 10 lbs of body weight per day. 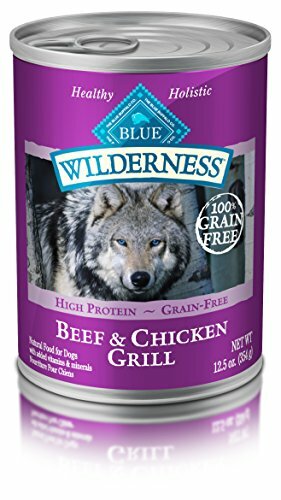 Blue Buffalo Wilderness Beef & Chicken Grill Canned Dog Food is some of the highest quality canned dog food but doesn’t cost as much as most of the canned foods that are made for specialty diets and conditions. As the ingredients are so basic and the fat levels are low, this is a great choice for dogs with sensitive stomachs. Those with smaller dogs will find these cans each last a few days so you will need to put a lid on it and keep it in the fridge for up to 3 days.